We now have a better idea of what to expect from one of HTC's first Windows Phone 8 device, with a leaked spec sheet detailing the HTC 8X's internals. The HTC 8X, previously known by its code-name HTC Accord, will have a 4.3-inch display capable of 720p resolution. It will run on a dual-core 1.2GHz processor with 1GB of RAM, 16GB of storage, NFC support, Beats audio, Bluetooth 2.1+EDR, Wi-Fi, GPS, and a micro USB port. The 8MP rear camera will come equipped with an f2.0 28mm lens, auto focus, and LED flash. The front camera will pack an "ultra-wide angle" lens, which will surprisingly enable it to record 1080p HD video. 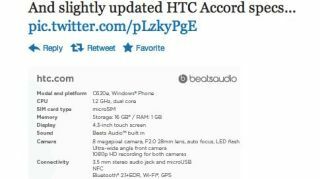 The leak comes courtesy of twitter tipster Football4PDA, who previously leaked the HTC 8X's name by posting shots from the handset's quick guide manual. Meanwhile, another leak today may have revealed when to expect the HTC 8X to arrive with carriers. Site TmoNews uncovered T-Mobile's release calendar, using the HTC Accord code-name to mark a Nov. 14 release date. The HTC 8X is supposedly the mid-range of three rumored Windows Phone 8 devices from the manufacturer, with the other two code-named Rio and Zenith. We'll know more about all three handsets when HTC's Sept. 19 event rolls around, where the company is also expected to unveil a new Android tablet.